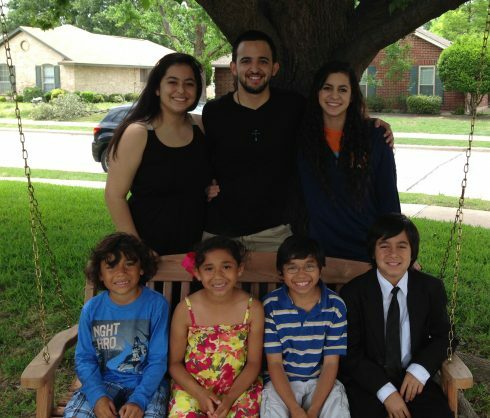 The Badillo children, back row from left are Anastacia, 17; Matthew, 23; and Gabi, 15. Front row from left are Christian, 8; Brianna, 9; Luis, 10; and Michael, 12. After they had their fourth biological child, Tricia (Maynard ’93) Badillo and her husband, Raymond, decided their family was complete. Fast forward 10 years, though, and they’ll tell you a different story. We continue our series about Abilene Christian University alumni who have followed their hearts to adopt. 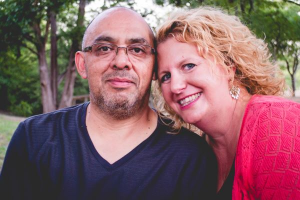 Tricia is an administrator with Coppell Independent School District in Texas, and Raymond works for Johnson Plastics. Here, Tricia, tells how their family grew from four children to seven almost overnight, with the adoption of three siblings. Our oldest had been out of the house for a year or two, and our then-youngest son, Michael, kept asking for a brother, so we began exploring the possibility of adoption. God led us to consider adopting from foster care. I called the Refuge House in Dallas after a recommendation from friends, and the process began. We had been told it would be lengthy and time consuming, but God had other plans! We had told our adoption worker we were interested in a boy between the ages of 4 and 7, but put no other qualifications on it. As we continued throughout the process, we also said we would be interested in a sibling group – two brothers – if they came available. Our application was complete the beginning of March. One week later – yes, one week later! – we were called about a possible match. A sibling group of two boys and a girl were available. They had been in foster care for almost three years but had not been matched with an adoptive family. When I told my husband about the children, he didn’t even flinch. We said “yes” instantly – even when I filled him in on their already troubled childhood. God was asking us to be the parents of a 4-year-old boy, a 6-year-old girl and a 7-year-old boy. Again, we were told it would be months and months before anything happened. But the timetable was beyond fast. By the end of May, all three children were with us permanently. Then the real journey began. God has been with us every step. His redemptive spirit has penetrated every doubt and struggle, and “seven” is our favorite number! (We tend to refer to our children by their “number” due to the sheer quantity of them!) There are so many more details that went into the process of getting our children and in our growing together as a family – the real work. But I have no doubt that God has equipped us with what we need for this time in our lives. I would love for more families to consider the possibility of adopting from foster care. There are currently more than 12,000 legal orphans in the state of Texas that are eligible for adoption today. Adoption is not just for those looking for an infant. Our family’s adoption journey continues as we grow together. In the weeks to come, we will introduce you to other alumni who help make a real difference in the world – and enrich their own families – by adopting and fostering children. If you have an adoption story or photos you would like to share with us, please email Robin Saylor, robin.saylor@acu.edu by Dec. 24.